Replay. 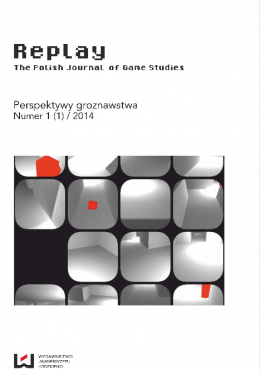 The Polish Journal of Game Studies is devoted to interdisciplinary study of games, gaming, and gamers. We publish original research results conducted from different perspectives, cultural, sociological, and philosophical among others, with a strong focus on the history of digital games. We wish to develop a common language digital games scholars could use independently from the perspectives they employ. For this reason, we also welcome papers concerning the typology of digital games and its corresponding terminology. The journal publishes papers both in Polish and English. Replay… adheres to the APA (American Psychological Association) style. Each manuscript should consist of no more than 8000 words (including references, notes, tables, etc.). The manuscript must include: summary/abstract (max. 150 words), keywords (5-8), references, ludography, short biographical note (max. 50 words) and correspondence address. Quotations: a) no longer than 40 words – font 12 point, within main text (without italics!) and within quotation marks, b) longer than 40 words – font 10 point, use line breaks to separate. CD Projekt RED (2007). The Witcher [PC]. Poland : Atari. Blizzard Entertainment (2004). World of Warcraft [PC Computer, Online Game]. Blizzard Entertainment : played 12 February 2010.